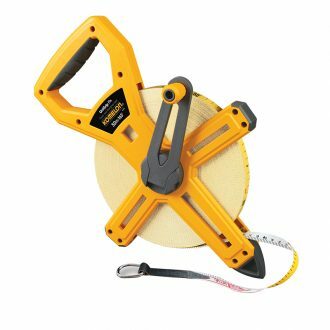 Komelon 50m x 13mm UniGrip Fix Fibreglass Tape Measures are manufactured with Komelons own fibreglass compression technology invented with 16,000 filament strands to withstand over 500kgs of pulling force. The Komelon 50m x 13mm UniGrip Fix Fibreglass Tape Measures are made to withstand 10,000 cycles. Other A grade brand fibreglass tapes show signs of wear and fading at 250 cycles. The Komelon 50m x 13mm UniGrip Fix Fibreglass Tape double-coated blade protects markings and gradations from chemical and mechanical abrasion. It is waterproof and dirt-resistant. Resists stretching even in extreme temperatures. Its white and yellow colours on either side of the tape prevents twisting whilst in use.